And it’s making gobs and gobs of money right now. 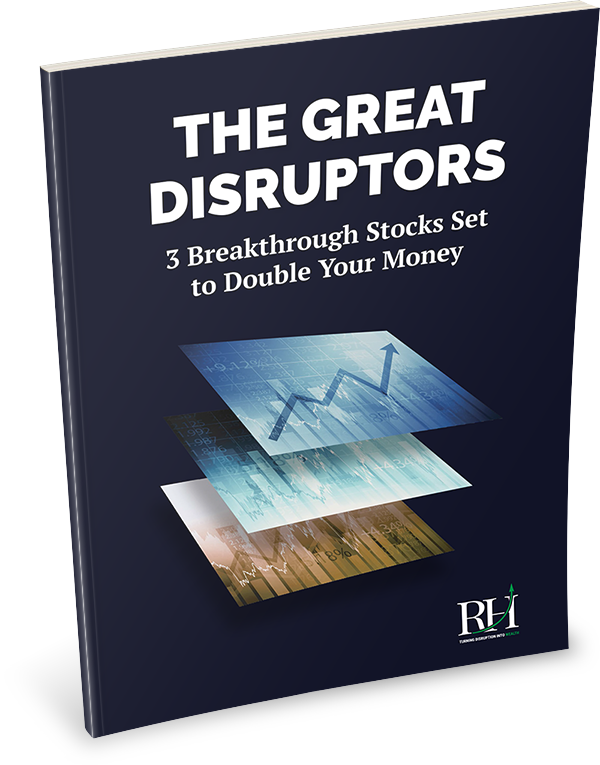 This business generates all of Amazon’s (AMZN) profits. AMZN has soared 3,900% in the past 10 years. Let me give you one more example before I tell you what this business is. 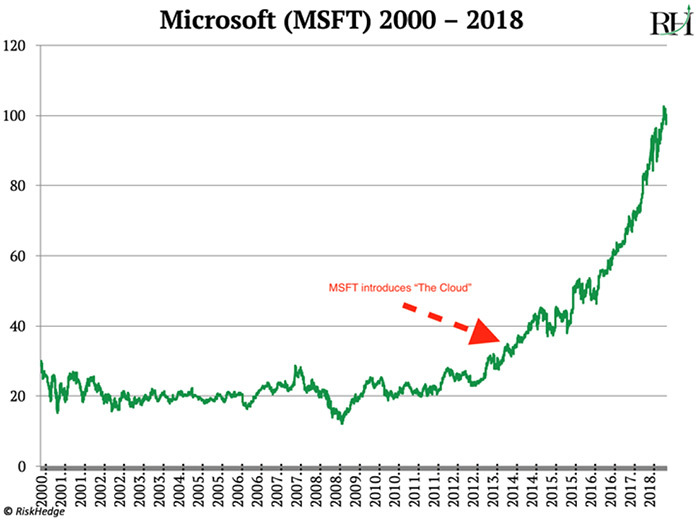 Have you looked at a chart of Microsoft (MSFT) lately? It went practically nowhere for 14 years leading up to 2014. Then, in 2014, MSFT re-geared to focus on this extremely profitable business. Its stock took off and roared to a 175% gain. To be clear, I’m NOT recommending you buy AMZN or MSFT today. Instead, I’m going to tell you about an under-the-radar tech giant that’s fueling AMZN and MSFT's huge stock gains. The super-profitable business I’m talking about is the cloud. “The cloud” is a fuzzy term that everyone’s heard of… yet few know what it really means. In short, the cloud gives businesses cheap access to powerful supercomputers. This might sound simple, but it’s actually pretty revolutionary. Before the cloud, buying expensive computers was a daunting challenge for any business. For example, a server that can handle website traffic for a small business costs about $5,000. A site that welcomes millions of visitors might need 50 of them. That’s $250,000, and we’ve barely scratched the surface. Where will a business put all these servers? That’s going to cost a couple thousand dollars in rent every month. Plus, you’ll pay a big electricity bill to keep the servers humming 24/7. And then you have to pay employees to maintain them. As you can imagine, these expenses can cripple a business, especially a smaller one. But the real key is this: the cloud allows your average laptop to tap into the superior power of big, centralized computers. Remember when we used to spend hundreds of dollars buying “memory” for our computers? Or upgrading storage so we had more room to store files? The cloud effectively makes this way of doing things obsolete. You can now flip on your laptop, connect it to a more powerful computer over the internet… and use its resources instead. Netflix had 9.4 million subscribers in 2008. Now it has over 125 million. Airbnb, an online network that connects property owners with paying guests, has grown even faster. In 2011 it had 1 million “stays.” Last year, it hit 100 million. That’s 100x growth in seven years. Both Netflix and Airbnb built their businesses on Amazon’s cloud, called Amazon Web Services (AWS). This helped them sidestep many of the biggest costs rapidly growing tech startups face. Using AWS, they didn’t need to buy faster computers, or build server centers, or pay employees to keep them up and running. AWS handles all this. Which means Airbnb can focus most of its time and money on what matters—disrupting the hospitality industry. Airbnb is worth $31 billion today. Ride-sharing service Lyft runs 100% on AWS. So does real-estate platform Zillow. Other AWS customers include Kellogg’s, Comcast, and 3M. Even giant firms like Boeing now use Microsoft Azure’s cloud. I believe most American companies will move to the cloud over the next five years. Leading tech research firm Gartner expects spending on the cloud to grow to $411 billion a year by 2021. And as money floods into the sector, earnings will shoot up for the companies that provide cloud services. This has already begun: AMZN’s cloud sales grew 43% last year, MSFT’s grew 93%, and IBM’s grew 30%. These are known as the “Big 3” cloud providers. Combined, their cloud revenues reached $53 billion last year. But I’m not buying their stocks right now. Don’t get me wrong: I like AMZN and MSFT. They’re great companies, and they’re leaders in the cloud, which is one of the world’s most profitable businesses. The problem is, their stock prices reflect this. We’d have to pay dearly to own them. AMZN’s price/earnings ratio is a sky-high 240. MSFT’s is 90. They must execute to perfection to justify these ridiculously expensive valuations. Maybe they’ll manage to do it, but I’m not willing to bet on it. Instead, I’m buying a different company that has a 98% market share in a crucial part of the cloud business. In fact, anybody who gets involved with the cloud has to buy this company’s products. I’m buying the world’s biggest computer chip maker, Intel (INTC). Earlier, I mentioned AMZN, MSFT and IBM earned $53 billion in revenue from the cloud revenue last year. Well, INTC supplies the computers and data centers these companies need to power their own clouds. You see, “the cloud” is just a term for the giant centralized data centers run by these firms. They’ll spend $60 billion on data centers this year alone. AMZN already has over 400 centers around the world. Each houses up to 80,000 servers. All these servers need computer chips. 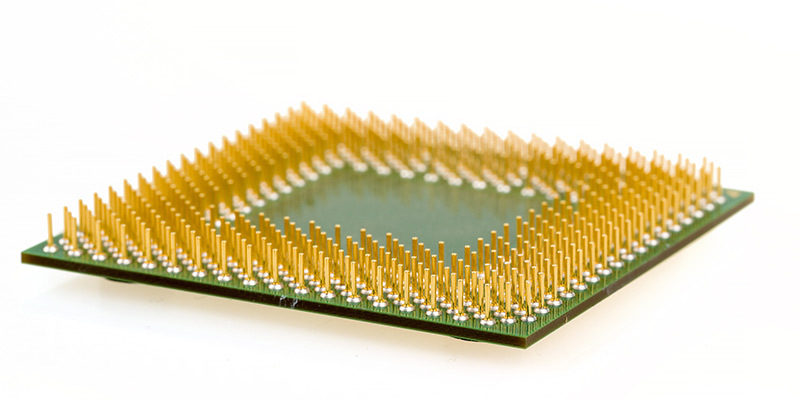 As we discussed a few weeks ago, chips are the “brain” that enables computers to “think.” INTC makes almost all the chips inside the servers… including AMZN’s and Google’s. INTC’s Xeon chips are installed in 98% of data centers across the world. The company has almost a complete monopoly on this crucial part of the cloud. The company made 30% of its revenue from its data center business last year. That’s $19.1 billion, an increase of 20% in the past two years. While a separate area of Intel’s business called “client computing” still accounts for 50% of its sales, its data center group generates almost as much profit. In INTC’s latest quarter, the client segment generated a profit of $2.79 billion. Its profit on data centers was $2.6 billion. INTC’s shift toward the cloud is making it far more profitable. Its net profit margin has climbed from 20% two years ago to 27% today. I expect INTC to capture billions more in profits as money continues pouring into the cloud. If you’ve been reading The RiskHedge Report, you know that’s not the only reason why I like INTC. As we talked about a few weeks ago, it also makes the “brain” and “eyes” for Waymo’s self-driving cars. They are zipping around the streets of Phoenix as you read this. INTC has gained 9% year-to-date (YTD). It sells for just 21x earnings, which is less expensive than the S&P’s average of 24. INTC is currently trading at $52, which is an excellent entry price. With cloud spending set to explode to over $400 billion a year by 2021, I’m looking for INTC to double over the next two years. What do you think? Are you ready to buy Intel?